The VOTE is in! Zoo Boise visitors used their conservation tokens to name a critically endangered white-backed vulture living in Gorongosa National Park in Mozambique, Africa. The winning name is Zelda, which is short for Zelador, which means ‘janitor’ or ‘caretaker’ in Portuguese, the main language spoken in Mozambique. 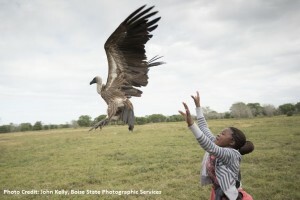 Zelda is 1 of 7 vultures being tracked as part of the Gorongosa Vulture Tracking Project by the Intermountain Bird Observatory at Boise State University. You can track Zelda’s (may be listed as #43 until updated) movements by going to https://ibo.boisestate.edu/vultures/. Why save vultures? Vultures are important, because they eliminate waste from the environment; waste that can harbor diseases. The purpose of the study is to determine where these birds are spending their time, what threats they may be facing, and how much time they spend inside vs outside the park. African vultures have seen huge population decreases, so by attaching GPS transmitters to the birds, researchers hope to learn where Gorongosa’s vultures spend their time and what dangers they face. Eight years ago, Zoo Boise reinvented itself. We made it part of our mission to protect animals in the wild. We turned the act of visiting the zoo into a conservation action. With the creation of a conservation fee and a series of fee-based animal interactions, Zoo Boise has generated more than $2 million so far for wildlife conservation projects around the world. In 2013, Zoo Boise and Gorongosa National Park in Mozambique formed a long-term restoration partnership. Gorongosa National Park was once the most biodiverse places on the planet, but was destroyed by years of civil war. Now Zoo Boise visitors are helping to protect the many incredible species that call the park home.